A successful exhibit build requires creativity, community and teamwork! Production processes in the exhibit industry require a high level of communication and creativity to ensure projects move fast, on track, and are delivered as promised. But, in an industry where constant hurdles and hiccups are the norm, can this type of service be guaranteed? “Absolutely,” says K2 Production Manager Mark Miller. Overseeing multiple projects at any given time, Mark is the lead production communicator responsible for planning, coordinating and directing the delicate details specific to each custom fabrication project. On a daily basis, Mark oversees all K2 team members by delivering immediate problem-solving skills, ensuring all necessary supply chain resources are ordered and available, and creating an achievable schedule that keeps projects moving to avoid backups. And, he never lets a finished product leave the facility unless it meets all of K2’s high-quality standards. 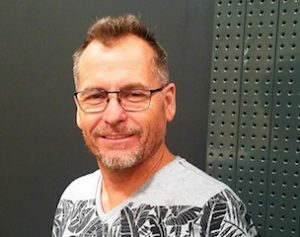 Mark’s ability to focus on each project’s successful outcome stems from 28 years’ experience in the trade show and theater set building industries. From setting up exhibits to managing labor and constructing visual structures, Mark is well versed in the intricacies of industry processes and accompanying branding strategies. At K2, Mark is highly respected for inventing creative solutions to assist the team in overcoming unexpected challenges, as well as for his in-depth knowledge and unlimited access to essential resources. He is also known for his commitment to constant communication to effectively optimize and streamline outlined project duties. Moreover, Mark’s follow-through abilities? Impeccable. When not overseeing K2’s projects, Mark can be found dirt bike riding, metal detecting, and spending family time with his wife and two daughters. He’s also having fun modernizing the family’s newly purchased home.